Born into a wealthy family, Jean Royere becames decorator at the age of 29 years. He gaves up a comfortable situation in the import-export business for the decorator. Without special training but lively with an innate taste for decoration, he began his career in a factory of the Faubourg Saint-Antoine and gets his first major command (the Carlton bar on the Champs-Élysées) in 1933. Its success was immediate and allows them to work until 1942 with Pierre Gouffé in creating original furniture and high quality. At the end of the war, having founded his own company, he decided to open branches in many countries: Lebanon, Egypt, Syria, Peru ... Jean Royère became at that time the decorator sovereign of the Middle East, claiming a style unique, the grounds declined with imagination and excess, boldness in the use of colors and materials. Its magical scenery make it one of the most amazing designers of the postwar registering on the margins of mainstream, offering unique solutions but still functional. Jean Royère worked with many artists such as Alice Colonieu. Before leaving France for the United States in 1980, the designer offered all its archives to the Musée des Arts Décoratifs, Paris. 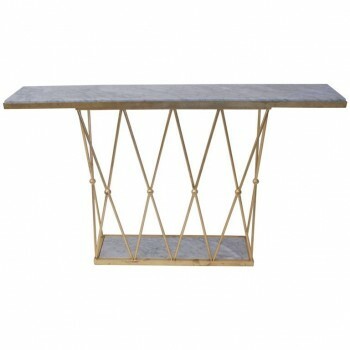 Style Jean Royère Console, Gilded metal, front and sides in crossed stem, Tray and base in white marble, circa 2000, France. Measures: Height 85 cm, width 140 cm, depth 25 cm. 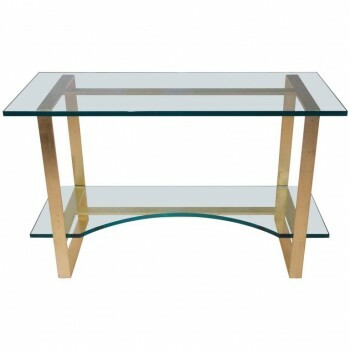 Style Jean Royère, Tour Eiffel coffee table, Gold-plated top and sides with braces, circa 2000, France. 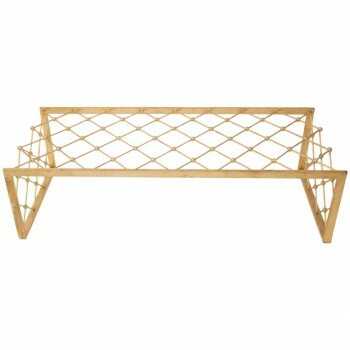 Measure: Height 35 cm, width 130 cm, depth 55 cm. 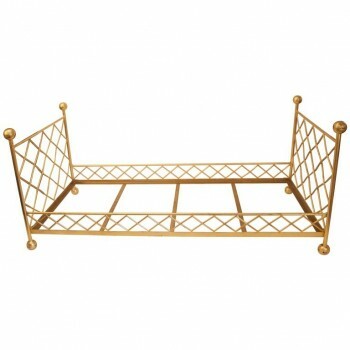 Style Jean Royère console, Gilded metal and glass tops, bottom top curved, circa 2000, France. Measures: Height 73 cm, width 120 cm, depth 50 cm. 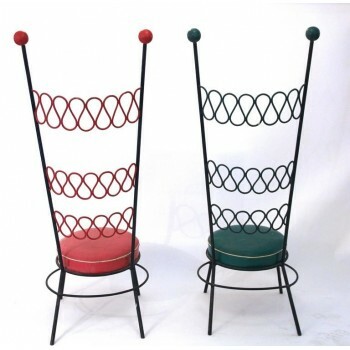 Pair of high chairs in the style of Jean Royère, Iron and original Skai, circa 1970, France. Measures: Height: 139 cm seat height: 38 cm, Width: 50 cm, depth: 40 cm.